Automotive | Welcome to XanRicketts.com! The Lamborghini Huracan is a confusing beast. Its base model costs $237,000. That’s considerable, to be sure, but it’s half the price of the Lamborghini Aventador. It’s arguably the subtlest modern Lamborghini ever designed, especially when you consider the electro-’80s-style edges of the Gallardo and the multiple gaping vents of the Murcielago. But its rib-cage-like back, exposed engine cavity, and spaceship profile remain the most extreme style elements on a production car today. It’s touted as the “driver-friendly” Lamborghini, suitable for canvassing both town and country. Stephan Winkelmann from Lamborghini even told me it was “easy on the road.” That must be a relative term. Its excruciatingly low clearance, 14-mpg gas mileage, absentee cup holders, dangerous lack of visibility, and miniscule trunk—I hesitate to even label it as such—make it painful as a weekend conveyance. On the way out east last Sunday morning, I was sweating speed bumps and the gas gauge—all the while fending off the overflow tote I had to place at my feet. The Huracan is a two-door, two-seat sports coupe. Those last bits—the parts about low clearance, zero visibility, and that insatiable thirst for fuel—are nothing new. Heck, we expect this sort of thing when we drive a Lamborghini. It’s part of the adventure. Yet I would argue that at this point, Lamborghini has got to move at least a hair’s width past that old model. I know it’s painful. But it can’t get away with those sorts of annoyances anymore. No longer is Lambo the esteemed family-run Italian house making dozens of cars a year for connoisseurs and enthusiasts who delight in indulging their inner automotive masochist, as it was in the 1970s. It’s part of Volkswagen, making thousands of cars a year, largely in Germany, for everyone from Kanye West to second-string power forwards in L.A.
None of this means the Huracan is a bad car. (Well, it is bad in the best sort of naughty way. It’s fun to use to blow past people on the highway, and it gets a lot of attention on the street.) But it does all mean that this bull is a mixed breed of Italian heritage forced to contend with conflicting demands from a neo-luxury, ultra-global market. If you decide to buy a Huracan, go in with both eyes open, as it were. If you don’t, you’re going to get burned. Priority No. 1: You must focus when you drive this car. The Huracan deserves it. It’s too powerful and fast and special—unlike the slick McLaren 650S, it has real personality—to treat casually. This car is born of track monsters, an animal built around a 602-horsepower direct-injection 5.2-liter V10 engine that can reach 200 mph on a casual afternoon jaunt. The Lamborghini Huracan contains a 602-horsepower V10 engine. Its doors do not open upward. I first drove this car when I worked for Forbes almost a year ago. At the time, I didn’t get to drive it on the track—so this time, up at Lime Rock racetrack near Sharon, Conn., I made sure to floor it, literally. You will, too, when you drive this. It’s impossible to resist the urge. When you accelerate, the thrust pushes you back as if you’re passing through a force field into some sort of other dimension. Though, for my money there are other cars—like that McLaren 650S—that just feel a shade quicker as you push them to the edge. The Huracan also contains Lamborghini’s first-ever attempt at a seven-speed dual-clutch automatic transmission, with four-wheel drive to boot. The gear modes include the “manual” Strada or the automatic Corsa. In both, the transmission operates unobtrusively and willingly—if not with quite as much élan as you might find in a Bentley Continental Coupe. There is a blissful lack of turbo lag, of any hesitancy whatsoever, when you punch the gas. The turn signal on the Huracan works similarly to that of a motorcycle. The Huracan is made from aluminum, with carbon-fiber components in the bulkhead, center tunnel, and B-pillars, which accounts for a 10 percent weight loss over the Gallardo. That means it’s better—lighter—around corners than predecessors. As I wound up Route 22 on the way to Lime Rock Park, it felt less like a brick and more like a very insistent pit bull. Thick but pliable if you get it pointed in the right direction and keep a firm hand on the collar (read: steering wheel). It’s about as wide in the shoulders as a pit bull, too. Accelerating in a straight line means tightening your stomach muscles as you feel the small of your back flatten against the seat. The subtle hum of the engine—hidden behind the top note of its roar—as the car launched under me confirmed that I had just achieved liftoff. Here is how it’s different from others in its price range: The best, fastest, most elegant Bentleys, Ferraris, Rolls-Royces want to help you when you drive. They aspire to conspire with you. The Huracan feels reptilian in comparison. It has power. It has edge. But it’s no easy breezy driver (see reasons stated above); it’s certainly not interested in developing any sort of mutually beneficial relationship. 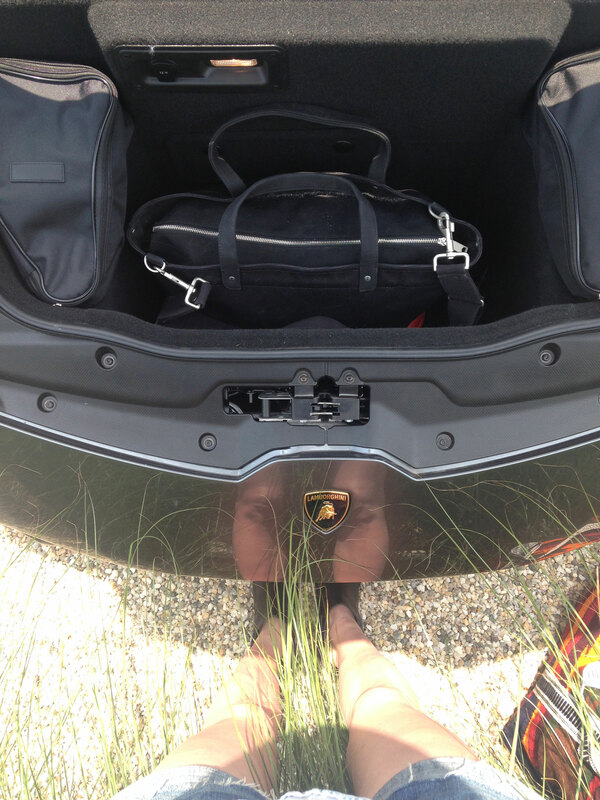 The trunk of the Huracan will fit one weekend tote. The Huracan is going to do what nature and its reptilian brain decree. You, as driver, are accessory to that instinct. Don’t get it twisted. About that visibility. The windshield is so narrow and slanted I had to crane my neck down any time I wanted to see if the stoplight in front of me had turned green yet. And you might as well remove the rearview mirror and give it back to the dealer before you drive off the lot. I couldn’t see a thing with it back there as I drove upstate, no matter how many times I adjusted it. On the Huracan, side mirrors are your friends. But yes, beautiful. I love how the Huracan looks. It tells everyone that it’s crazy and intimidating and fast and mean—and it doesn’t have to use a single word to convey that message. No, you won’t get those suicide doors that swoop up like they do on the Aventador, but you do get those sick vents along the rear roof, and the low-slung swagger of a race car. It sounds strange to say, but everything else is minimal. And rightfully so. The audacity of those lines alone demands enough attention, emotionally. This is the kind of car you feel you could sketch in about three lines. The interior is unusual; all of the buttons are grouped in a row across the center console, like a rocket ship, and the start button sits hidden under a fire-engine red flip-top cage. There’s a whole process to engaging the parking brake—but it all fits with the overall character of the car. 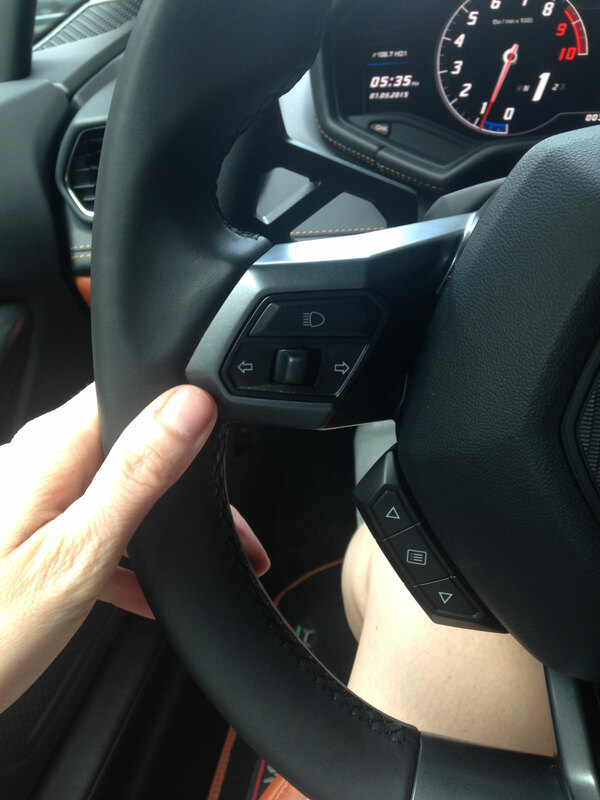 Other oddities: The turn signal is a single button that you push with your thumb and have to manually turn off half the time, too, as it’s not very sensitive. The gauges are all electronic, rather than “real” analog; the slim, disappearing door handles flip open when you push the unlock button; and the heated sport seats ($2,800 extra if you want them) are firm enough to make you sore after a day on the track. The Huracan contains distinct styling elements, especially along the rear. And, as I mentioned, the trunk is basically an offense to anyone who believes in traveling with more than one pair of shoes.